Why is Tungsten the Material of Choice for Wedding Rings? Tungsten is fast becoming one of the most popular choices of materials for a wedding ring. While gold, silver, and platinum still enjoy the majority of the market for both men and women, tungsten is fast gaining ground. In the United States, almost a third of men now favor tungsten as their material of choice. Why is it such a popular option when it comes to choosing a wedding ring? The big thing tungsten has going for it is that it looks amazing. More to the point, it doesn’t stop looking amazing during its lifetime. Tungsten stands out in a way that gold or the other materials before just don’t. If you have a tungsten ring on your hand, it is going to draw attention no matter what you do or where you go. Okay, so let us explain about the “doesn’t stop looking amazing” part. Tungsten rings are diamond polished (well, they are when you get them from Men’s Tungsten Online) which ensures that they maintain their shine at all times. 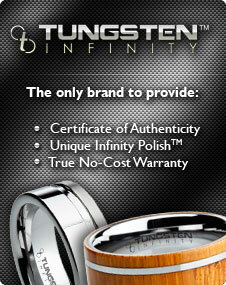 If you’re looking to quality test a tungsten ring, then try to make it lose its shine. If you can’t do it, then you know you have quality in your hands. In addition to the shine, tungsten carbide, which is what a quality tungsten ring actually is, not 100% tungsten, is one of the toughest materials we’re able to produce, second only to diamond. Therefore, you can be confident that your ring is going to withstand whatever rigors you might throw at it as you live your life. Nor will you ever need to send a ring to the jewelers for repair or any maintenance. Basic tungsten rings are excellent, but they get even better when you think about the ways in which they can be customized and made unique. Whether you decide to have a tungsten ring with an inlay such as meteorite, or have your ring laser etched with a special message to commemorate your day, you can make a tungsten ring even better in many ways. If you’re planning your wedding, or even want to replace your existing wedding rings, tungsten is the modern alternative that will give you everything you need from such a ring, whether you go for a basic type of wedding ring or something more elaborate and spectacular.